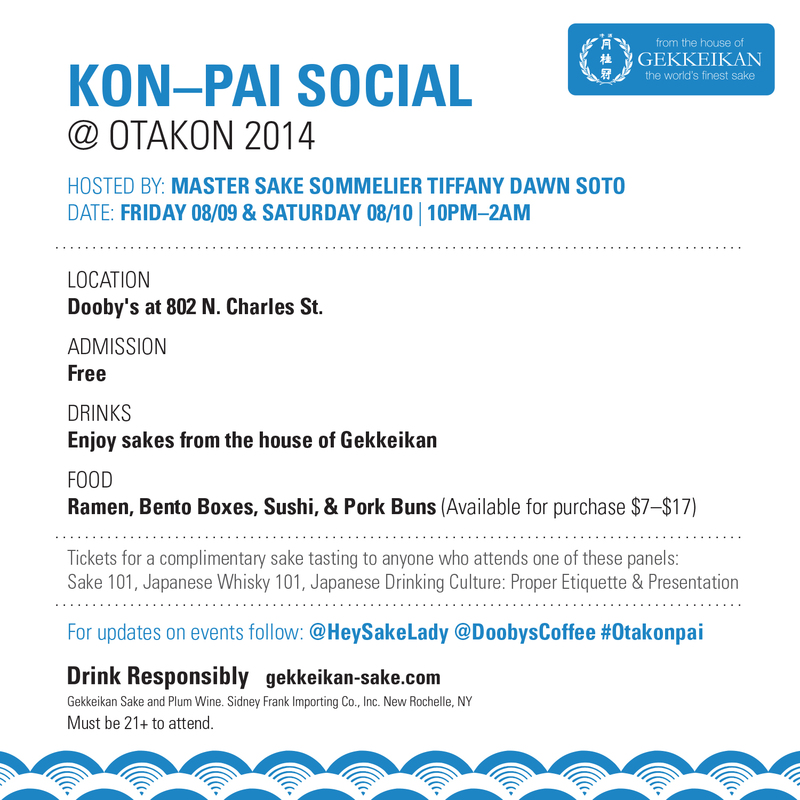 We’re so Excited for Otakon 2014! We can’t wait for Otakon 2014!!! I’m beyond grateful, and completely humbled to be in such amazing company in this article by the fabulous Laura Hayes. Not only does she write for the Washington Post and numerous other publications, but she also blogs about fabulous regional cuisine via her site, Best Thing on the Menu. Thank you Laura, and all of the women included in this article. When you raise a glass of craft whiskey to your lips, you’re not just sipping some potent amber alcohol. You’re also consuming centuries’ worth of history, countless aroma compounds, and the immeasurable fruits and labors of a hard-working distillery. And that bottle of sake you’re drinking alongside your California roll? It’s way more than the sweet results of fermented rice. Rather, it’s an ancient liquor steeped in Japanese tradition with roots in religious ceremonies. And don’t even get us started about what’s going on in your favorite bottle of wine. The takeaway? You sure do drink a lot. And also: For the layman, this alcohol stuff can be complex. Which is why we set out to find D.C.’s preeminent authorities who could answer our burning questions and demystify our favorite types of alcohol. And did we mention they all happen to be women? Along the way we learned the best way to mix a martini (James Bond is wrong! ), how hot your sake should be (trick question: It’s best served cold) and whether you should buy wine from Trader Joe’s or Whole Foods (sorry, Two Buck Chuck). No, ‘The Day We Fight Back’ is not like the SOPA/PIPA fight. It’s a bigger challenge. Tseng, who has been bartending in D.C. since 2000, admires sherry for its versatility. “You don’t want to manipulate it too much. But at the same time, it’s super adaptable. Sherry makes any cocktail better.” She’s amassed 102 different sherries for the bar, and serves them in flights with small bites inspired by La Venencia, a popular Madrid wine bar. 20 kinds of squash I can identify in sake,” Soto says. The Howard County, Md., resident is the only non-Japanese female kikizakeshi (master sake teacher) certified in brewing, service and education. She acquired the title after collecting four certifications from the Sake Service Institute, taking additional courses and completing two brewing apprenticeships. Through her business, Sake 2 You, she runs “sake safaris” to Japan, teaches a class geared toward business professionals called “Sake for Success” and is working on a book about incorporating sake into everyday life. “I’m trying every day, all day to make people feel like it’s less bourgeois,” Soto says. While enrolled as a student at the University of Aberdeen in Scotland in 2008, Ewing showed up at The Grill Bar, one of the city’s oldest and most celebrated pubs, and asked for a job. “I knew nothing about whiskey, but they gave me a chance,” she says. Now at 25, Ewing is one of 1,300 certified Scotch experts in the world, according to the certifying body, The Scotch Whisky Experience. Hassoun started at The Gin Joint — an 11-seat bar below New Heights — in March 2010 as a bartender, with only a shot of gin knowledge. Now as manager and beverage director, Hassoun possesses enough knowledge to play gin matchmaker with guests who need a little guidance. “Only one in 300 people come in and know what they want,” she says. Beyond gin, Hassoun’s true passion is tonic. With help from Mom, she makes her own under the moniker Chronic Tonic (thechronictonic.com). Morgan, the 19th female to be named master sommelier in North America by the Court of Master Sommeliers (there are 135 master sommeliers in North America), was exposed to vino at an early age by parents who liked to entertain and didn’t believe in a kids table. The sommelier track caught her eye while she was working as a cocktail waitress on dollar beer night in college. “Once I understood wine wasn’t just for stuffy old French men, I realized it’s the coolest job in a restaurant,” Morgan says. As a consultant, she helps restaurants like Bryan Voltaggio’s Aggio build creative wine lists, and organizes private events for oenophiles. Thank you so much Amanda for featuring us in this fantastic article. Working with you was an absolute delight. We always love to see talented writers helping to spread the sake love. Sake used to be a drink consumed by just a few—typically aficionados of Japanese food and culture—but that’s been changing in recent years. The fermented rice drink has evolved from a ceremonial beverage most often heated and served in traditional, ceramic cups to a premium spirit that’s enjoyed more like a scotch or fine wine. Sake is also an excellent base for cocktails. 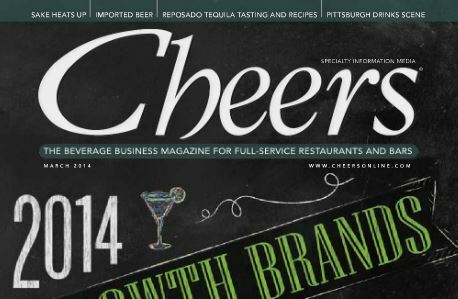 “Sake is getting bigger and people are getting more interested in it,” says Adrien Falcon, beverage director at Brushstroke. The New York restaurant, which serves Japanese kaiseki (multicourse) cuisine, has a list of 50 to 60 sakes by the bottle and another 15 by the glass. Bottles of sake range in price from $60 to $1,300 and glasses from $13 to $24. Eiji Mori, sake director for Innovative Dining Group, changes up the sake menu at its Katana concept in Los Angeles a few times every year to introduce new beverages and new breweries. The restaurant offers 55 sakes, ranging in price from $20 to $200. Most diners, Mori says, order bottles of middle-grade sake, which is priced in the $70 to $80 range. Katana also has six sakes by the glass, which are priced from $8 to $18, and a sake flight with three different grades (2 oz. each) for $18. While many refer to sake as rice wine, it’s actually brewed from fermented rice using a process similar to making beer. Sake is available in many different grades that vary by how polished the rice is—the more polished the kernel, the finer the sake. These are the four most common grades of sake. Daiginjo. The most highly polished rice kernels are used to prepare daiginjo sake, which tends to be light and fragrant. At least 50% of the rice kernel is polished away for this grade of sake. Ginjo. The ginjo sakes are slightly inferior to daiginjos, and have 40% to 50% of the rice kernel polished away. These are higher in alcohol (usually 18% to 20%). Honjozo. Just about 30% of the rice kernel is polished away for honjozo sakes, so typically some alcohol is added during fermentation. These sakes tend to be dry, medium-light and relatively smooth. Junmai. Full-bodied junmai sakes are more acidic than the other levels and they pair easily with most foods. Junmai means pure, and these sakes are made from rice, filtered water and koji mold (the yeast used to start the fermentation). 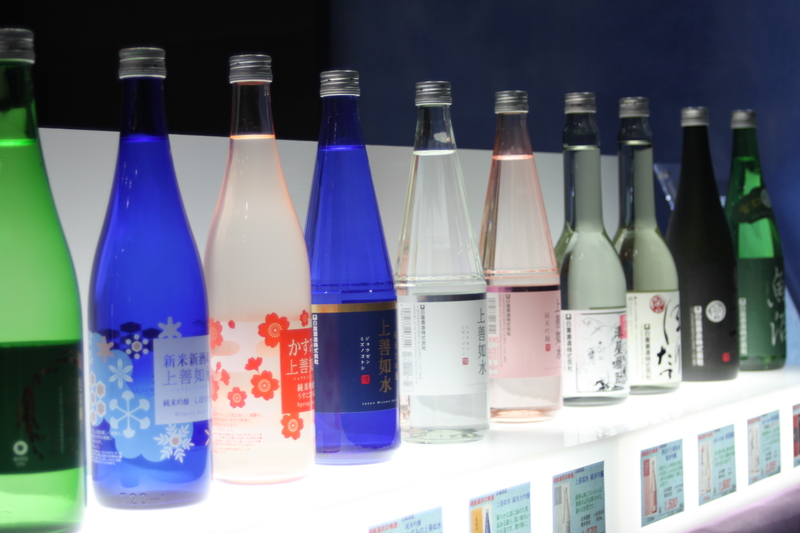 One variety of sake that has become popular lately is nigori. It’s an unfiltered sake, so nigori is cloudy, and tends to be sweeter and more fruity than other sakes. Brushstroke always has two or three nigoris by the glass, priced from $13 to $25. They pair well with bold flavors and tofu, says sommelier Jacob Daugherty. Nigori is also big at Katana, where it’s typically offered by the the bottle. Although just one style is offered by the glass, Mori will open bottles of nigori on request. Opened sake lasts for about a week in the refrigerator. H2O, a seafood restaurant in Smithtown, NY, has a full sake menu featuring two junmais, one junmai nigori, and one daiginjo. The 300-ml. bottles of sake range in price from $21 to $58. “I’ve found people prefer it by the bottle, because it’s just three or four servings,” says Paolo Villela, beverage director for Bohlsen Restaurant Group, which owns H2O. Customers mostly order the sake to pair with sushi, but it also goes well with other seafood dishes and even spicier meals, he says. Several operators are using sake in cocktails as well. H2O, for instance, offers a Saketini made with junmai sake, vanilla vodka and fresh lemon juice, served in a Martini glass garnished with cucumber. RA Sushi has a Strawberry Saketini (nigori sake, vodka, strawberry puree, simple syrup and citrus) on its menu at all times. It also promotes monthly drink specials, such as the Frozen Red Bull Cherry Bomb, a mix of Red Bull, Three Olives cherry vodka, soju (a distilled Korean beverage), orange juice and Monin cherry syrup. Katana serves a lychee-infused and a yuzu-infused sake for $12 apiece. It uses premium sake, and adds the fruit for a day before it pours off the liquid. The restaurant also sometimes makes these with flavored syrups, too, which last longer (made with fresh fruit the sake lasts about a week) and have consistent flavors. Phoenix-based P.F. Chang’s offers a Yuzu Ginger Mojito made with junmai sake, TY KU citrus liqueur, yuzu juice, fresh lime juice, and house-made ginger beer. And the Asian bistro chain’s Rock-n-Berry is a favorite summer cocktail that contains sake, fresh cucumbers and strawberries, and lime juice, says director of beverages Mary Melton. Both cocktails are priced at $9. But while these drinks do fairly well at P.F. Chang’s, its traditional cocktails are more popular, she says. For certain, not everyone is a fan of sake cocktails. Casual dining chain operator Ruby Tuesday had offered a Pomegranate Sake Martini for a few years but took it off the menu about two years ago. “Sake’s plateaued, at least,” says beverage director Ken Lennox. Sake is most frequently consumed warm in the U.S., but this can be a mistake, says Tiffany Soto, founder of Sake2You Consulting in Las Vegas and founder/president of The North American Sake Institute. In Japan, she explains, sake is sometimes warmed, but only to around 105ºF. To avoid errors, Soto recommends serving sake cold. Most sakes are best at around 45 to 55 degrees, she says. Sake is supposed to be delicate, intricate and subtle, Soto says. “As it gets warmer, different aromatics can take over and you miss out on the chance to appreciate the nuances.” Serving sake too cold can have the same effect, she notes. But many consumers love their sake heated up. Hot sake is the No. 1 seller at H2O, for instance. Tokya will heat some sakes in the winter and add spices. Salicetti says he’ll combine cinnamon, clove, star anise, fennel seeds and allspice in a small cheesecloth bag and drop it into the warm sake for about 20 seconds. These drinks are then garnished with fresh herbs, such as rosemary or sage. Amanda Baltazar is a freelance writer based in the Seattle area. Life in Japan revolves a lot around rituals, and one of them is that you shouldn’t pour your own sake—you’re supposed to let others pour it for you. But for bars and restaurants that serve sake, it’s okay to let this one slide, says Tiffany Soto, founder of Sake2You Consulting in Las Vegas, and founder/president of The North American Sake Institute. “Restaurants are trying to give this extra level of service by pouring sake for customers,” Soto says. But it’s better to let them do it themselves. “From a business perspective, they’re going to drink more, and they’ll have more fun with it,” she notes. That said, there are other aspects of sake service that operators should pay more attention to. These are a few common mistakes bars and restaurants often make with sake. Serving sake too hot or too cold. Sake should be served at 45ºF to 55ºF degrees and no warmer than 105ºF. Not providing enough information on the sake menu. Instead of “puffy language like ‘light and dreamy,’ provide information on the quality level, where it’s from, plus a tasting note,” says Soto. Serving sake that’s too old. Sake is stamped with a shipping date, and it should be used within two years of this date, Soto says. Tiffany Dawn Soto wants to talk sake. A master sake sommelier or kikzake-shi, she is a leading sake expert in North America, consulting for a variety of companies and leading “sake safaris” several times a year in Japan. Fortunately for us, Soto’s also the part of the team at Four Seasons Hotel Baltimore, home to PABU Izakaya, where she regularly helps diners choose from more than 100 premium sakes and leads seminars on demystifying this often-misunderstood fermented rice beverage (for starters, it’s not actually rice wine). In honour of International Sake Day (October 1) and Four Seasons Hotel Baltimore’s month of sake events, here’s the Taste Q&A about all things sake. What’s your favourite, surprisingly amazing, food and sake pairing? Dawn Soto: My absolute favorite food to pair with sake is a pulled pork sandwich with a rich tangy sauce (I usually make mine from a sake base). There are dozens of sakes that would pair well with this, but personally, I like Wataribune Junmai Ginjo. What are some of the more common misconceptions about sake, and how do you address them? DS: When I’m speaking with guests that are dining at PABU for the first time, I spend about 60% of my time clearing up misconceptions. The most common is that sake should be served hot, because previously they have been served something called sanzoushu (sake cut with grain alcohol). The alcohol content of sanzoushu is higher and does not taste good, and heating it masks the flavour and reduces the alcohol content. Premium sakes, on the other hand, are much lower in alcohol content than people think (another big misconception), actually only 15-16% on average, so if we heated it up, there wouldn’t really be any alcohol left. 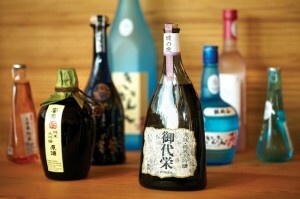 Another misconception about sake is that it will give you a bad hangover, which is true for sanzoushu, but not for sake. In reality, premium and super premium sakes are sulfite-free, low in residual sugar, and lacking the impurities that give you a bad hangover. What would be your dream way to celebrate International Sake Day? DS: Ideally, I would spend a whole month in Japan. October is the end of rice harvest, and with all of the Japanese maple trees changing colour, it is a magnificent sight to see. I would love to work my way through four prefectures (regions) throughout the month, maybe attend the autumn festivals and enjoy as much kubocha (Japanese pumpkin) tempura as I could get my hands on. What kind of glass do you recommend and why? DS: Every premium and super premium sake calls for a different glass. When a sake has more nuanced aromatics, I prefer a glass with a larger bowl like a bordeaux or burgundy glass, which helps increase the evaporative surface, thus releasing more aromatics. When a sake has aromatics that are more overt (typical of futsuushus and junmais), I tend to gravitate towards a small stemless glass with little surface area. When a sake is clean in style with a lighter delicate nose, I prefer a stemmed glass with a small bowl (Spieglau port or sherry glass). When I don’t have the luxury of many options, I recommend a stemmed glass with a bowl that isn’t too large or small. What’s your best piece of advice for people wishing to learn more about sake? 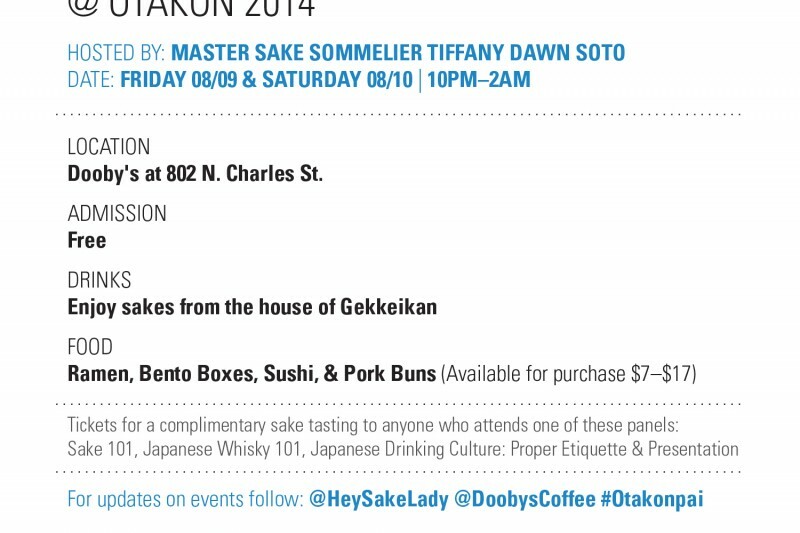 Follow Master Sake Sommelier Tiffany Dawn Soto on Twitter @HeySakeLady or visit her website, Sake2You.com. Learn about wine from another friendly, expert Four Seasons sommelier, Dana Farner on Taste or get the inside scoop on a night out in Tokyo from Four Seasons Magazine.